Southern In Law: Wedding Wednesday: "The ring"
The search for "The Ring" started way back in December 2011, while Jesse was in Sydney. We looked at a dozen jewelry stores with no success, so we made the decision that once I got to Louisiana we'd look again at the jewelry stores there. The first week I was in Louisiana, the search began. We looked at every jewelry store we could and as I have teensy tiny fingers, all of the rings just looked odd or ridiculously large. I started to wonder if we'd ever find a ring that didn't look like I'd stolen my Great Aunt Beatrice's hideously gaudy costume jewelry. I need something that was petite and feminine and I wanted something that looked almost vintage in appearance. The first weekend we headed off to Mississippi to visit his grandmother and hadn't had a chance to look any further. In the car on the way back we decided we'd have another look at the mall once we got back. I'd decided, at this point, that I was feeling lucky and Jesse agreed with me (or so he said!). We got back to his Mom's house, left my Mum and the groceries and were off to start the search once more. Once we got to the mall, we only had an hour until it closed so we decided if we found something we found something but if we ran out of time, sobeit! We walked into the jewelry store and I told the salesperson we were "just looking". Little did I know that just a few seconds later I spotted "the ring" and started hovering around the display case. I started pointing it out to Jesse saying "oooooooooohh, that's preeeetttyy" and the sales guy soon caught on to my odd behaviour. He made his way around the counter and asked if I wanted to try it on - Ummm... is the Pope Catholic?!?! I tried it on and the second I did I knew that I'd found it. Just to make sure, I tried on two other rings. Those rings were off in a second and "the ring" was straight back on. I only had one week before I left Louisiana to go back home so the store had it sent out as a 'rush order' to get it re-sized. We were told they would do everything they could to get it in before I left, but they couldn't make any promises. We then waited patiently for them to call to say it was in the store. Thankfully when we were on our way back from Lafayette on the Thursday, we got a call saying the ring was in the store and we could pick it up whenever we wanted. We got back to his Mom's house, dropped off groceries and my mum (I see a habit forming here, haha) and we were back in the car to pick up the ring. It fit perfectly and was even prettier than I remembered, but I wasn't allowed to have it just yet! It went back in the box because Jesse wanted to propose officially. That didn't mean I wasn't teased with it though! Jesse found it quite amusing knowing I so desperately wanted it on my finger when he showed it to his family and my mum. I didn't find it so amusing! He started asking whether he would take the ring in his carry-on or in his suitcase on the way back to Sydney and I started to wonder whether he really was going to wait or not. But clearly he did not, next week I'll tell you all about how he proposed! Yes, I chose my engagement ring because Jesse wanted me to have something that I loved seeing as I'd be wearing it for the rest of my life. I couldn't be more thankful for that as I'm really particular about jewellery and now I have a ring that I ADORE and never ever want to take off my finger. 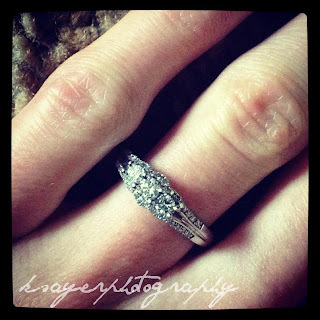 Ladies, if you're engaged/married - who picked your ring? If you haven't gotten to that stage yet, would you want to choose? The wonky picture annoys me, haha. I think i'll need to take an actual photo not an ipad one :P But thank you! The husband and I chose the ring together. We actually had the same style in mind, which made things easier, but we still spent heaps of time in stores searching for that perfect ring haha. It's so hard, you don't want to buy just anything because you'll be wearing it forever! I knew when I found it because I wasn't thinking "ooh but there might be something better"
Haha, excellent work! I thought I knew what I wanted before we looked, but then once we started looking they just didn't look right. Poor Jesse has to watch me try on a million rings, but it was so worth it! And we've already picked out the wedding band and I can't wait! Congratulations on your engagement and wedding, Kristy! Finding the perfect ring for you is definitely fate. Once you laid eyes on the glowing elegance of the ring and felt differently about it from the rest surrounding it, you know that THAT IS IT. The princess center glows with a double diamond bloom along with the round diamonds halfway along the band. It fits you perfectly!